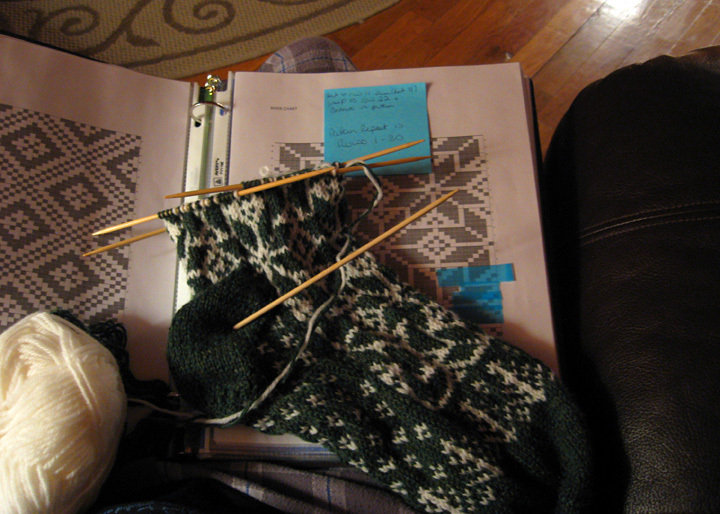 I should be working on my Featherweight cardigan, but I’m taking a break and, instead, working on a new sock project. 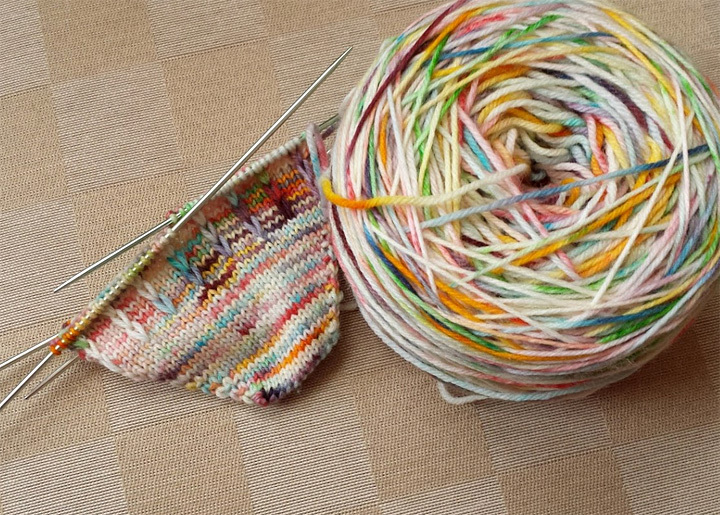 Life has been complicated and stressful lately and socks are comfort knitting for me. 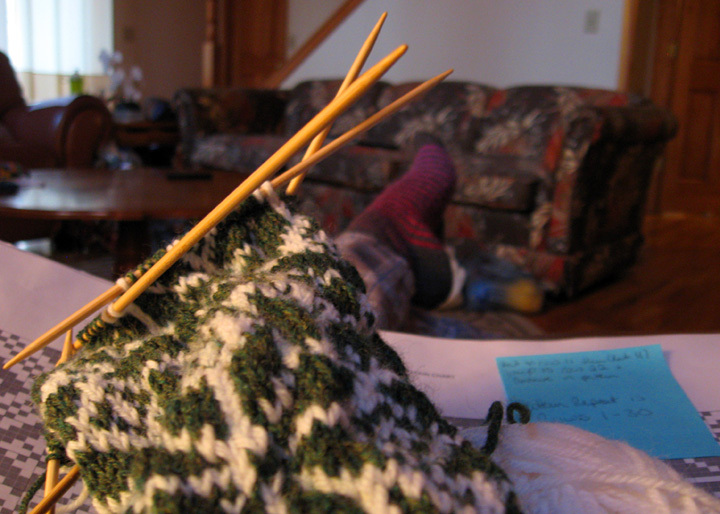 Second nature, almost – just cast on and knit. Mindless but not. Fast knitting, but also not. The perfect project to pick up after a long day and work a few rows on without having to pay attention too much, providing the pattern you’re using isn’t overly complicated. 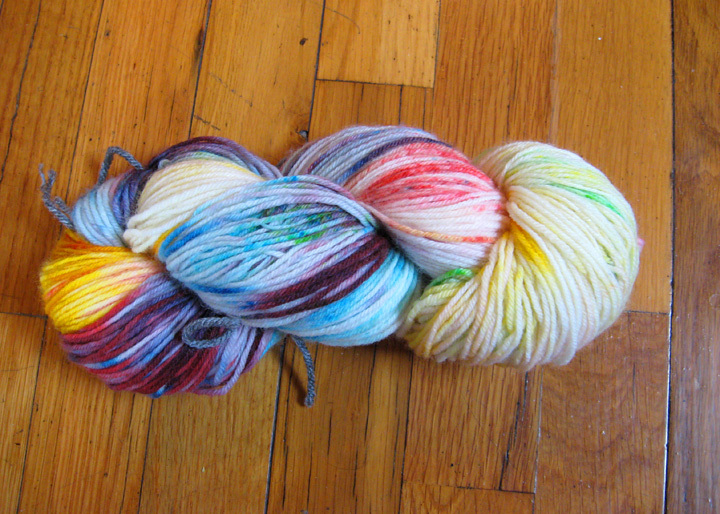 I’ve cast on with the yarn I dyed back in November on my annual knitting weekend. It’s so pretty in the skein, so I was excited to see how it turned out once wound and knit. It’s very… colorful. It’s fun seeing the before and after a bit, much in the way it is with spinning yarn. It’s always amazing to me how one item becomes another, and how one pattern of colors works up once spun and/or knit. I’m happy to report that the winter weather appears to finally be breaking – the forecast shows 40s and 50s all week! Can you believe that?! There’s still snow on the ground, but it’s melting which is the important thing. My seedlings are started, though much later than I intended to get them going, and so as long as I don’t forget to water them we’ll be set for the garden this year. Spring is officially making its way in, and with it a world of possibilities. There are so many exciting, wonderful things I’m looking forward to this spring – soccer games, gardening season, a trip to Chicago (I’ve never been, and I’m going to be on my own while the Mr is at a conference during the day. Do you have any suggestions on things I should go do? Yarn shop recommendations? I’m both excited and nervous about being in a big city I’ve never been to before! 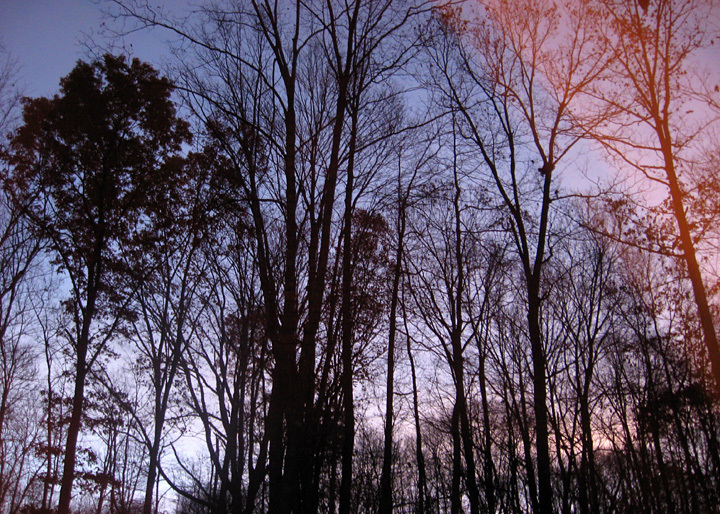 ), getting back into running… so many happy things to come! It’s Easter today, which means this weekend I had a bee in my bonnet about dyeing eggs. 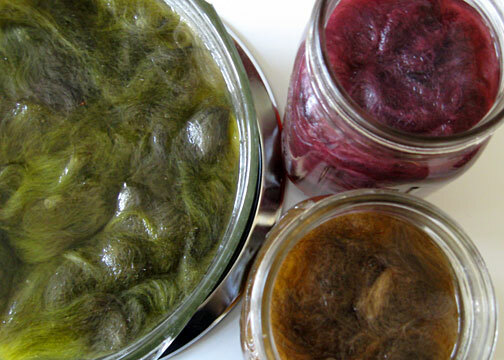 But I didn’t want to just do any ol’ dye job – no, I wanted to play with natural dyes with what I had in my kitchen. Which happened to be blueberries and turmeric. I mostly just winged it after looking at a few online sites (the process isn’t complicated by any means) – boiled up some blueberries with some water, strained the whole thing and added some vinegar, and then let my eggs sit overnight in the refrigerator to soak up the dye. The turmeric I just mixed with some hot water and vinegar and shook it all up in a canning jar before adding eggs and popping in the fridge. The eggs had a ‘film’ on them – you had to be careful handling them because it would easily rub off. At first I thought I did something wrong, because they didn’t seem quite as perfect or as pretty as ones I had found online. But then, they don’t really need to be perfect, do they? And that film? It’s because the vinegar starts to eat away at the shell after being left in the dye overnight. 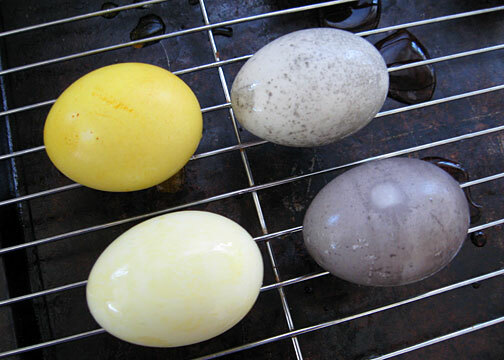 I rinsed two eggs to see how they looked – the turmeric one ended up retaining dye but looking mostly pale yellow compared to its bright and golden counterpart. The blueberry version ended up looking speckled and quite pretty, though obviously not as vivid as the non-rinsed version. Next time I’ll start the dye process in the morning and not let them sit for quite so long and see how that effects the film issue. 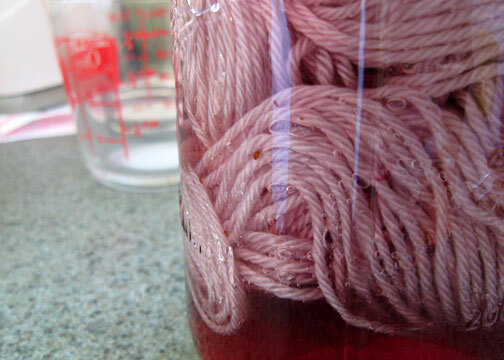 Or find a different mordant to use instead of vinegar. 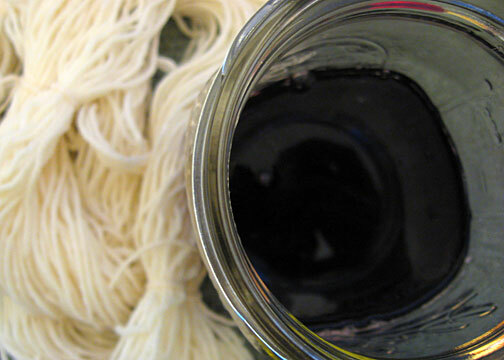 And of course, being a knitter, I had to skein up some spare wool and dye some yarn with the leftover blueberry dye. 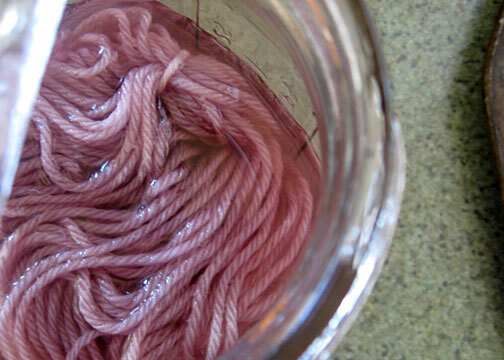 I soaked the yarn in some warm water for about 20 minutes before draining it and moving it to the canning jar. Microwaved it for a few minutes off and on and let it cool until the dye was “exhausted” (meaning the color had been absorbed by the wool and the water was quite clear), rinsed it, and now it presently hangs from a door handle to dry. 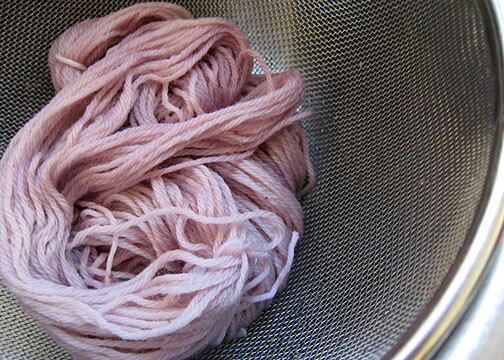 It’s quite a pretty pale purple color and I’m curious to see how the color changes on the yarn as it dries, especially as the eggs ended up more slate gray than purple or blue. 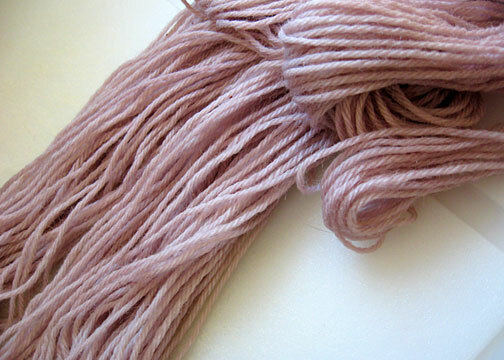 Monday I decided, on a whim, to dye some fiber. 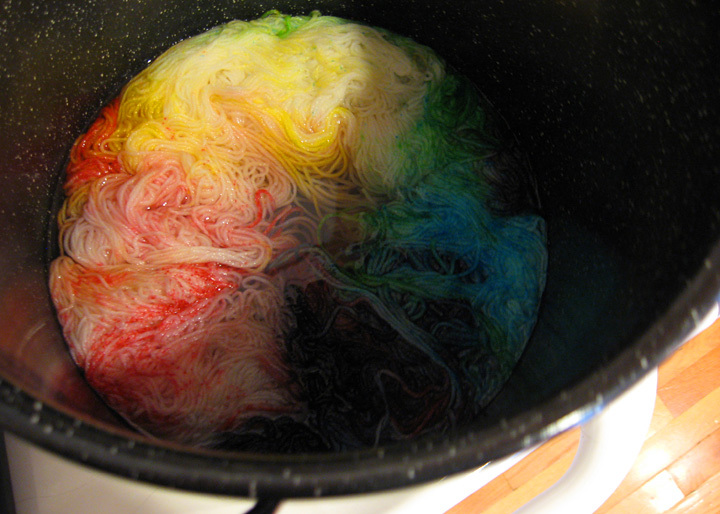 I had egg coloring kits on hand, and I had fiber fluff, and I had a Monday at home to clean and dye fiber in between work projects. Ahhh the joys of being your own boss at least part of the time! What I started out with was a few handfuls of alpaca fluff. 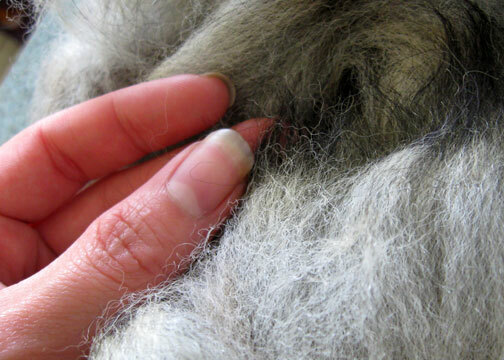 It’s a really pretty fiber – grays with bits of black. I initially thought I’d spin it up as-is, but then I decided I have a whole pound of the stuff so who cares! Dye that sh*t up! I went for orange, yellow, and red. Mainly because pretty much any other color combination didn’t appeal to me whatsoever. 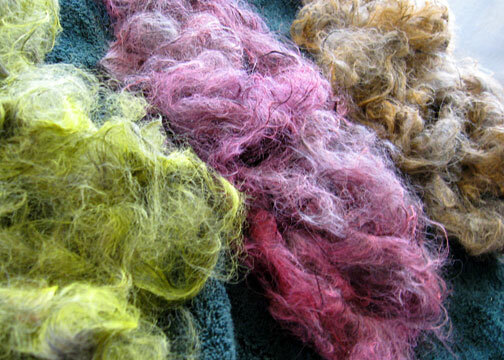 The fact that the fiber was so mixed in natural color made for some interesting dyed fiber. 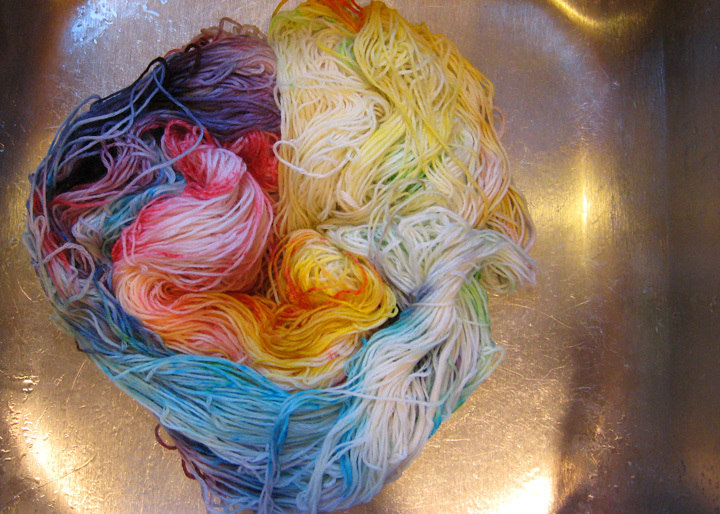 At least while it was wet/in the dye bath. Annnnnd then it dried. 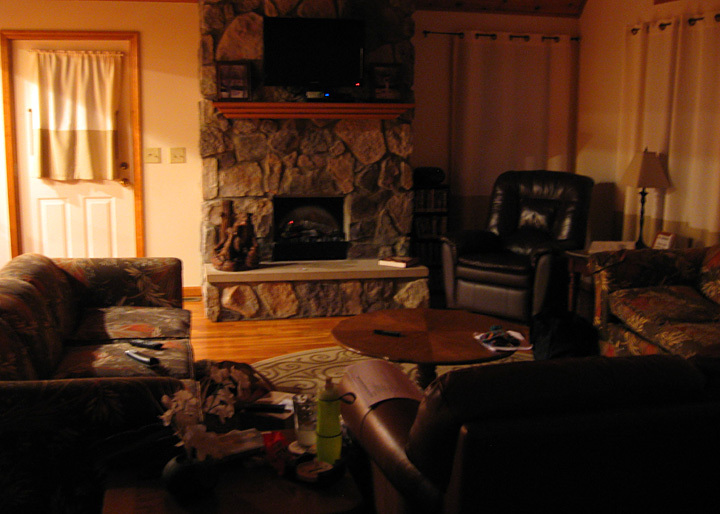 And look at that – bright yellow, bright pink….. and a really ugly orange. Damn. Not at all what I was hoping for. Maybe it’ll spin up nice and pretty? I was hoping to have a nice bright orange to match. I had a mind to make a pretty little cowl out of this, with both singles spun and plied one color to the next in long blocks to almost have a graduated effect. Now it’s just going to be bright yellow and bright pink on the ends with a muddled middle. Not cool.